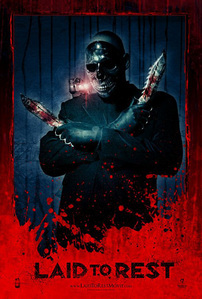 What is the name of the movie that the character in the metal Skull mask with the big blades is from in the pic above? Looks really cool so I want to find out mais about the movie. It's from the movie Laid to Rest. Great movie, check it out! I just watched this movie, and I loved it. The story line was a bit unique, but the best parts were the awesome kills. Very bloody and creative. I will definitely watch the sequel.